for my last game of the year, i decided to wrap up my experience with rusty’s real deal baseball for 3DS, one of the few games released this past year that i actually played through, and one of nintendo’s first forays into free-to-play gaming. the game has a unique hook: although the 10 individual minigames supposedly have a base price of $4, the game features in-game haggling whereby you can reduce the price of the set from $40 down to a much more reasonable $16. the frame story involves a middle-aged dog trying to revitalize his business as well as repair his family life, and although it serves as a cute device the “story” such as it was didn’t really increase my compulsion to buy more minigames. 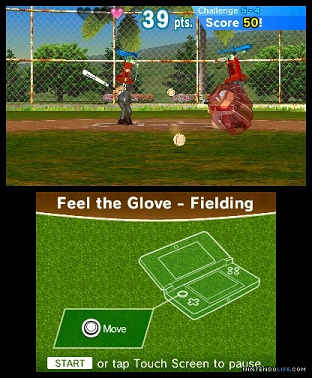 the minigames themselves have a very warioware type of aesthetic (apparently totilo at kotaku thought so too), which i enjoyed, and each one (approximately $2 each) distills some aspect of baseball (hitting, catching, even umpiring) and presents a set of 50 basic and 50 advanced mini-challenges plus two endless modes. i played through the majority of three of the minigames (bat & switch, quick catch, and feel the glove), and there’s a good amount of variety within each set, there’s a uniformly high level of polish, and the controls in general feel pretty good (although some take getting used to). because of the arcade nature of the challenges, there’s a distinct feeling of pointlessness of achieving them since given enough time you’ll get it eventually (a classic case of “i could be learning to be a pro basketball player in the time it would take to complete this challenge”). with games like wii sports of wii fit i’m more willing to waste time on pointless challenges since i’m also at least burning a few calories, but in this case without a compelling story or goal my need to be a completionist just wasn’t enough for me to want to finish all the advanced challenges (some of which will have your blood boiling and rage quitting in anger, and apparently i’m not the only one who felt that way). i found the challenges were also not really suited for short “pick up and play” type bursts, due to the amount of concentration required. i didn’t feel the need to pay for the rest of the minigames (especially since some of the ones i was more interested in were the ones that didn’t unlock more of the story), so i’ve set this one aside for now. if i were more interested in baseball i could imagine this would’ve been an easier sell to me, and although i didn’t end up seeing the game through to the “end” i enjoyed the time i did spend with it overall. nintendo would’ve gotten more dollars out of me if they had just released this as a single package, but i love that they tried a different and completely unique approach to micro-transacations, and i can definitely see myself picking up a couple more at some point in the future. even though i’ve been playing mostly first-party nintendo games lately, i’ve been on a roll getting caught up with series that i had previously completed but had new entries, so i thought i’d finish off new super luigi u, released as DLC for the wii u game new super mario bros. u as well as a standalone retail release. i’d been somewhat disappointed in NSMBU overall when i finished playing through it early this year, and although it’s a completely solid game i, along with many others, found it to be far too close to the other games in the “new” super mario bros. series, particularly NSMB2 and NSMB wii. since NSLU was DLC, i was able to enjoy it as an expansion to NSMBU, so the fact that all the assets, the world map, and the boss fights, were identical to the main game didn’t really bother me. the level design is pretty solid (although some elements, such as yoshi, are as underused as in the main game), and the game changes things up a bit in significant ways. the obvious one, of course, is the fact that luigi is the main character and features the return of his trademark higher flutter jump (and slippier footing on the ground). the game also limits the levels to 100 seconds, which as a result makes them slightly more compact. the game is more challenging than the original, which is a plus for me, and to offset that the designers made nabbit a playable character who is invincible to enemies (but not pits, lava, etc.). despite all the similarities, the game still manages to slip in some surprises. collecting all the star coins and finding all the secret exits is in general still very much worthwhile (although finding the exits in particular can be painfully arbitrary and somewhat a waste of time), but one nice surprise was the luigis hidden in every level. i hadn’t realized there was one in every level, but it’s a nice touch to the game, as it was released to celebrate the year of luigi. it would’ve been nice if there were some system to track that you’d found them all, but many of them are located near secrets anyway. there are also some other cute surprises, like special snowmen in the ice world. the miiverse integration is the same as NSMBU so it’s still a nice way to include a social element, although it’s kind of disappointing you can’t up vote esp. good comments or mark some as inappropriate. 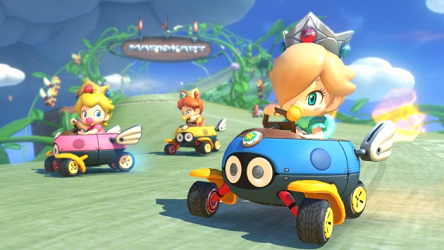 overall this is an enjoyable game as DLC and as an expansion of NSMBU, even though it doesn’t really push the series forward at all. still, it’s nice to see luigi get a significant share of the spotlight. since the wii u version released today, i thought i would collect my thoughts on super smash bros. for nintendo 3DS. 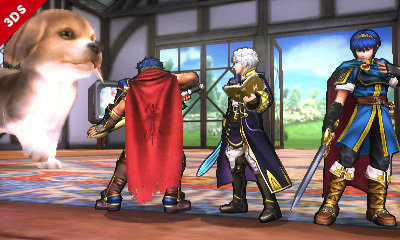 the 3DS version has been out for just shy of two months, and by now the new characters (which include two awesome, completely off-the-wall additions) have found their unique places amongst what has become an impressive roster of veteran fighters. sakurai, the director, has done a great job of sustaining the hype from the day the game was first announced to today, and as always the wild speculation over which characters would be included was pretty much a national pastime amongst nintendo fans until the final roster was revealed. although the story mode was cut in this iteration, the character reveal trailers were a great substitute and a great way to accompany the announcements of the new characters. the first aspect of the game to consider is of course the characters. in general i would say the new characters don’t add as much uniqueness to the series overall as compared to the previous game’s batch, but there’s a lot of variety and they’re each satisfying to use (with perhaps the exception of the mii fighters who, because of their completely customizable nature, end up feeling oddly generic). although i miss the ice climbers and snake, their closest replacements (rosalina + luma and a hidden character) provide some of the same flavor and so are somewhat of a consolation. i like that previously combined characters such as samus and zero-suit samus have been made completely separate, and although it takes a lot of time to unlock all the options it’s also entertaining to play around with each character’s moveset variants. the game was intended to be more serious as a competitive game than its predecessor, and although i’m not an expert it seems like most people have been pretty happy with how it turned out in that regard. from the characters’ movesets overall it seems like the game requires a more deliberate play style than before (for example, a lot of the characters have countering moves or moves that put up a shield), but the game is still fast paced and fun at whatever level of skill you’re playing at. in terms of modes, the game doesn’t really offer too many surprises with the exception of the new “smash run” mode. that mode feels very casual, and although it’s fun to battle against the mix of enemies from different series, the ending battle that decides the final outcome feels too random. having a portable smash bros. game is such a technical achievement that it feels churlish to complain, but its limitations are obvious. although many of the stages have fun gimmicks, the game only has a small number of them, even compared to brawl and esp. 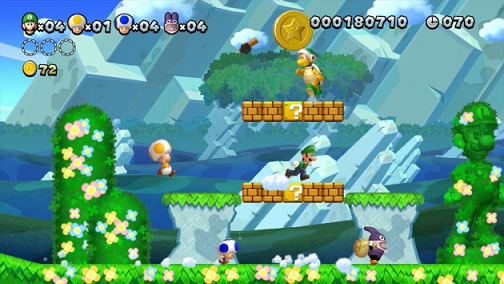 compared to the wii u version, and each stage only has two pieces of music. i’ve been playing it on a 3DS XL and the game fits decently well within the confines of that system’s screen size, but i imagine the game would feel much more cramped on a regular 3DS. there’s not a lot more to say. the game doesn’t offer much in the way of new modes, but the series has always been about the core battling, and the new characters, tweaks to the old characters, and customizable moves provide a lot of great gameplay that will sustain us for the years we’ll have to wait until the next entry. the game is a solid entry in the series, and although overall the game feels limited on the 3DS compared to its big brother on wii u, being able to battle on the go definitely makes up for its limitations and it’s great to have both options. – table of the series’ playable characters. squirtle and ivysaur = gone but not forgotten! although i’ve worked my way through quite a few series by now, including the zelda series, i haven’t finished any remakes of any of the games, or any replays. i recently dusted off the legend of zelda: four swords anniversary edition on DSiware not long ago, and finished up the last two stages that i was planning on tackling this playthrough, which were the last two (of three) bonus stages in the “realm of memories” (more on that later). a little history lesson for people who may not already know. the four swords game was originally combined with the GBA remake of a link to the past, and at that time required two people to play (my post on that game is here). 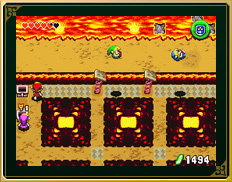 the game was succeeded by the gamecube game the legend of zelda: four swords adventures, which again focused on multiplayer, but didn’t require it since the game enabled you to switch between characters and change the configuration of your team (e.g. a horizontal or vertical line) as needed. this remake is of the GBA game, although it’s a standalone release and, similar to the gamecube title, has the new feature that you can play it entirely solo (along with being able to switch between two characters, the AI jumps in and controls the other character when needed). the solo mode works perfectly well, and from that perspective the game is already a big improvement over the original version. however, other pluses are that it was a free download, and it enables simple-to-connect local co-op with DSis and 3DSes (as opposed to the GBA’s multi-link cable). the DSi and 3DS’s second screen is used to show the locations of the other players and the goal but isn’t an actual map; it functions more like a radar, just giving you a general sense of where things are relative to you. but the big draw is that this release includes 18 additional stages, more than doubling the amount of content in the original. these take the form of the “hero’s trial” (more-difficult stages unlocked by winning 5 multiplayer matches or collecting 30,000 rupees), and the “realm of memories”. the “realm of memories” is particularly notable because these stages revisit familiar locations from past games (namely link to the past, link’s awakening, and the original NES title). although the link’s awakening stages are spot on (and even presented in black and white) and include the same sprites as the original game, i was slightly disappointed to find that the stages based on the original NES title used the same sprites as the link’s awakening stages, although that’s just me being nit-picky. aside from the layout and presentation, those stages don’t have much to do with the original games since they feature the same enemies and mechanics as the rest of the game, but it’s a nice bit of nostalgia and a great inclusion in this title which was released for the series’ 25th anniversary. all in all this game is a definite improvement over the original and enjoyable overall, esp. with other players. although it includes more stages, the game does start feeling repetitive pretty quickly (although not nearly to the extent as four swords adventures which was a total slogfest), and it’s still somewhat annoying that you have to beat all the regular stages three times in order to get the final ending (which i just don’t have the patience for). the zelda series has always been about the exploration and the puzzles, and so since this game is more focused on combat and multiplayer there’s not much chance it will rank that high in my list of favorites in the series. still, it’s nice to have a change of pace compared to the rest of the series, and it was fun to see familiar locales from previous games in a new setting. mario and wario paint and compose in mario paint and warioware D.I.Y. it’s been a long time since i’ve “completed” a warioware title, and the reason is that warioware D.I.Y. for DS was next in line and i’m not really into games that focus on creativity since i’m not very artistic, and when i’m playing a game i’d rather just be playing a game than creating. anyway, before i get into warioware D.I.Y., it’s pretty much impossible not to talk about that game without mentioning its well-known predecessor mario paint on SNES. i’d never played mario paint, so i gave it a quick spin. one thing mario paint was famous for was introducing the SNES mouse and basically has three modes: a cute and cartoony version of photoshop in which you can create still images and animations; a cute and cartoony composer mode in which you can create music with a maximum of three notes at a time; and a bonus mini-game called “gnat attack” (aka “coffee break” or “fly swatter”) in which you navigate the mouse around to swat at flies and other enemies. i enjoyed my time with mario paint and it’s cute and colorful, but a big drawback to the game (and a deal-breaker by modern standards) is that you can only save one image and otherwise there’s now way to save your results other than record it to a video recorder via your TV, or utilize modern means, such as an emulator’s save states. as for warioware D.I.Y., i dove into playing through the mini-games first, and these are the typical warioware fare. the game focuses on touchscreen controls and in that sense is very much like warioware: touched, although the games feel somewhat average in general, although that could just be that the formula has worn thin. before long i was exploring what the rest of the game has to offer, which includes 4-panel comics to read that unlock daily, many of which are quite entertaining (albeit fairly surreal), and a listening center. on the creative side the game includes a comic strip maker and a music maker (with a max of 4 simultaneous notes + 1 rhythm track instead of mario paint‘s 3). the game offers multiple ways to ease you into the main event, microgame creation: one way is the “jobs” section, where you can take on tasks to replace artwork from microgames (taken from the original warioware title, i believe). the photoshop-like art creator, which is pretty much the same in all the modes, is similar to mario paint‘s, and is equally cute and colorful and similarly surprisingly deep. the game also provides three in-depth tutorials to take you through increasingly complex ways of creating objects and programming simple interactions in order to create your game. after working through some of the microgame creation it becomes clearer why the pre-made microgames feel more basic than usual, because you can actually import any of them and modify them as you like to create your own version. this is a great way to get into the creation without having to start from scratch, and also a great way to learn how the game programming works since you can see how other microgames were set up. the game also includes stamps that you can use in lieu of having to create your own artwork, which is also helpful for people without much in the way of artistic skills. when the game was originally released, the wi-fi connection features were a big part of the interactivity, with new microgames made available on a regular basis (some by famous real-world game developers themselves) and contests were held to make a microgame that matched a given theme. it’s too bad those features were available for such a short time, since the game came out at the tail end of the DS’s cycle (just a year before the 3DS was released). 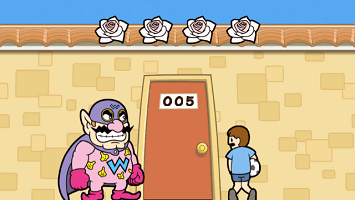 the game also features interactivity with the wiiware title warioware D.I.Y. showcase, where you can transfer your creations (or any of the other microgames) from your DS to the wii to play with the wiimote (another reason why the microgames were more simplistic, since they had to be compatible with the wiimote’s point-and-click capabilities). i haven’t sat down and played through that yet, but prob. will in the near future. 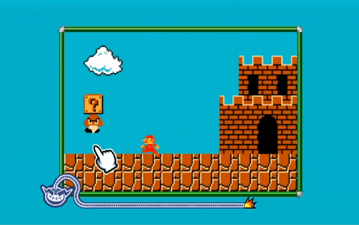 all in all mario paint, although regarded as a classic, seems fairly superseded by warioware D.I.Y.. the latter provides many more capabilities as well as plenty of options to save your games, although still no ability to export to anything outside of your DS or wii. although i enjoyed my time with the game, i’m not really the intended target since i’m not really into being creative within my gaming time, but otherwise this is an easy recommendation to people who are looking for that kind of experience. 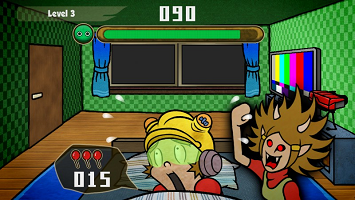 – a theme from sonic recreated in warioware D.I.Y. – how to get mario paint theme music to play in D.I.Y.